Important! The reprints of articles are subject to the copyright by their respective publishers. These are provided for educational use only. 80. ​H. Du, X. Li, P. Yao, J. Wang, Y. Sun, and L. Dong, “Zinc oxide coated tin oxide nanofibers for improved selective acetone sensing,” Nanomaterials, 8, 509 (2018). 79. S. Tabassum, L. Dong, and R. Kumar, "Determination of dynamic variations in optical properties of graphene oxide in response to gas exposure based on thin-film interference," Optics Express, 26, 6311-6344 (2018). 78. Y. Wang, M. A. Ali, E. K. C. Chow, L. Dong, and M. Lu, "An optofluidic metasurface for lateral flow-through detection of cancer biomarker," Biosensors and Bioelectronics, 107, 224-229 (2018). 77. M. A. Ali, S. Tabassum, Q. Wang, Y. Wang, R. Kumar, and L. Dong, "Integrated dual-modality microfluidic sensor for biomarker detection using lithographic plasmonic crystal," Lab on a Chip, 18, 803-817 (2018). ​76. Z. Xu, Y. J. Wang, Y. Chen, M. H. Spalding, and L. Dong, "Microfluidic chip for automated screening of carbon dioxide conditions for microalgal cell growth," Biomicrofluidics, 11, 064104 (2017). ​75. Q. Wang, D. Mao, and L. Dong, "Thermomechanically tunable infrared metamaterials using asymmetric split-ring resonators," IEEE Journal of Microelectromechanical Systems, 26, 1186-1188 (2017). 74. S. Oren, H. Ceylan, and L. Dong. "Helical-shaped graphene tubular spring formed within microchannel for wearable strain sensor with wide dynamic range," IEEE Sensors Letters, 1, 2501204 (2017). 73. S. Oren, H. Ceylan, P.S. Schnable, and L. Dong, "High-resolution patterning and transferring of graphene-based nanomaterials onto tape towards roll-to-roll production of tape-based wearable sensors," Advanced Materials Technologies, 2, 1700223 (2017) (Featured on Front Cover). 72. S. Tabassum, R. Kumar, and L. Dong, "﻿Nanopatterned optical fiber tip for guided mode resonance and application to gas sensing﻿," IEEE Sensors Journal, 17, 7262-7272 (2017). 71. Q. Wang, D. Mao, P. Liu, T. Koschny, C. M. Soukoulis, and L. Dong, "NEMS-based infrared metamaterials via dynamic tuning of nanocantilevers within complementary split ring resonators," IEEE Journal of Microelectromechanical systems, 26,1371-1380 (2017). 70. S. Tabassum, R. Kumar, and L. Dong, "Plasmonic crystal based gas sensor towards an optical nose design," IEEE Sensors Journal, 17, 6210-6223 (2017). 69. P. Gurrala, S. Oren, P. Liu, J. Song, and L. Dong, "﻿Fully conformal square patch frequency selective surface towards wearable electromagnetic shielding﻿​," IEEE Antennas and Wireless Propagation Letters, 16, 2602-2605 (2017). 68. M. A. Ali, C. Singh, S. Srivastava, P. Admane, V.V. Agrawal, R. John, A. Pandya, L. Dong, and B. D. Malhotra, "Graphene oxide – metal nanocomposites for cancer biomarker detection," RSC Advances, 7, 35982–35991 (2017). 67. Z. Xu, X. Wang, R. J. Weber, R. Kumar, and L. Dong, "Nutrient sensing using chip scale electrophoresis and in situ soil solution extraction," IEEE Sensors Journal, 17, 4330-4339 (2017). 66. J. Marshall, X. Qiao, J. Baumbach, J. Xie, L. Dong, and M. K. Bhattacharyya, "Microfluidic device enabled quantitative time-lapse microscopic-photography for phenotyping vegetative and reproductive phases in Fusarium virguliforme, which is pathogenic to soybean," Scientific Reports, 7, 44365 (2017). 65. H. Jiang, M. A. Ali, Z. Xu, L. J. Halverson, and L. Dong, "Integrated microfluidic flow-through microbial fuel cells," Scientific Reports, 7: 41208 (2017). 64. M. A. Ali, K. Mondal, Y. Wang, H. Jiang, N. K. Mahal, M. J. Castellano, A. Sharma, and L. Dong, "In-situ integration of graphene foam-titanium nitride based bio-scaffolds and microfluidic structures for soil nutrient sensors," Lab on a Chip, 17: 274-285 (2017) (Featured on Front Cover). 63. X. Wang, H. Jiang, Y. Chen, X. Qiao, and L. Dong, "Microblower-based microfluidic pump," Sensors and Actuators A: Physical , 253: 27-34 (2017). 62. M. A. Ali, H. Jiang, N. K. Mahal, R. J. Weber, R. Kumar, M. J. Castellano, and L. Dong, "Microfluidic impedimetric sensor for soil nitrate detection using graphene oxide and conductive nanofibers enabled sensing interface,” Sensors and Actuators B: Chemical, 239: 1289-1299​ (2017). 61. P. Liu, S. Yang, X. Wang, M. Yang, J. Song, and L. Dong, "Directivity-reconfigurable wideband two-arm spiral antenna," IEEE Antennas and Wireless Propagation Letters, 16, 66-69 (2017). 60. Y. Wang, J. Song, L. Dong, and M. Lu, "Optical bound states in slotted high-contrast gratings," Journal of the Optical Society of America B, 33: 2472-2479 (2016). 59. Y. Jiao, C. W. Young, S. Yang, S. Oren, H. Ceylan, S. Kim, K. Gopalakrishnan, P. C. Taylor, and L. Dong, "Wearable graphene sensors with microfluidic liquid metal wiring for structural health monitoring and human body motion sensing," IEEE Sensors Journal, 16: 7870 - 7875 ​(2016). 58. Y. Chen, Y. Tian, Z. Xu, X. Wang, S. Yu, and L. Dong, "Microfluidic droplet sorting using integrated bilayer micro-valves," Applied Physics Letters, 109: 143510 (2016). 57. M. A. Ali, K. Mondal, Y. Jiao, S. Oren, Z. Xu, A. Sharma, and L. Dong, "Microfluidic immuno-biochip for detection of breast cancer biomarkers using hierarchical composite of porous graphene and titanium dioxide nanofibers," ACS Applied Materials & Interfaces, 8: 20570-20582 (2016). 56. 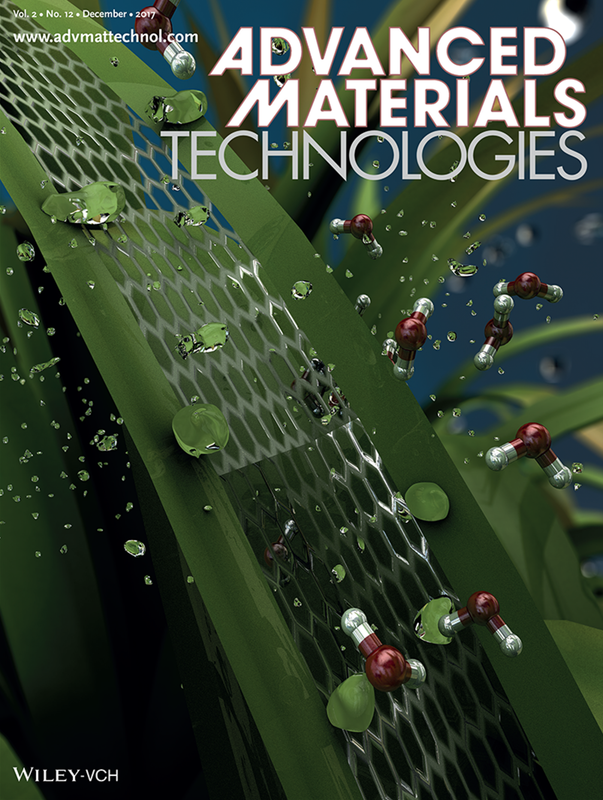 M. A. Ali, W. Hong, S. Oren, Q. Wang, Y. Wang, H. Jiang, and L. Dong, "Tunable bioelectrodes with wrinkled-ridged graphene oxide surfaces for electrochemical nitrate sensors," RSC Advances, 2016, 6, 67184-67195 (2016). ​55. Z. Xu, H. Jiang, B. B. Sahu, S. Kambakam, P. Singh, X. Wang, Q. Wang, M. K. Bhattacharyya, and L. Dong “Humidity assay for studying plant-pathogen interactions in miniature controlled discrete humidity environments with good throughput,” Biomicrofluidics, 10, 034108 (2016). Also, see Erratum Biomicrofluidics 10, 059901 (2016). 54. Q. Wang, W. Hong, and L. Dong, "Graphene 'microdrums' on freestanding perforated membrane for high sensitivity MEMS pressure sensor," Nanoscale, 8, 7663-7671 (2016). 53. L. Liu, J. Zhang, M. A. Badshah, L. Dong, J. Li, S.-M. Kim, and M. Lu, "A programmable nanoreplica molding for the fabrication of nanophotonic devices," Scientific Reports, 6, 22445 (2016). 52. S. Yang, P. Liu, M. Yang, Q. Wang, J. 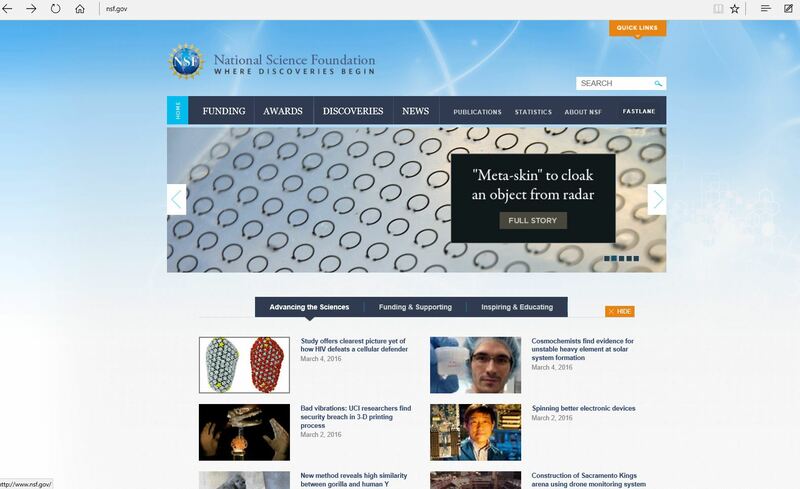 Song, and L. Dong, “From flexible and stretchable meta-atom to metamaterial: A wearable microwave meta-skin with tunable frequency selective and cloaking effects,” Scientific Reports, 6, 21921 (2016). 51. Y. Wang, L. Liu, Q. Wang, W. Han, M. Lu, and L. Dong, “Strain-tunable plasmonic crystal using elevated nanodisks with polarization-dependent characteristics,” Applied Physics Letters, 108, 071110 (2016). 50. Q. Wang, W. Han, P. Liu, and L. Dong, “Electrically tunable quasi-3D mushroom plasmonic crystal,” IEEE Journal of Lightwave Technology, 34: 2175-2181 (2016). 49. Q. Wang, L. Liu, Y. Wang, P. Liu, H. Jiang, Z. Xu, Z. Ma, S. Oren, E. K. C. Chow, M. Lu, and L. Dong, “Tunable optical nanoantennas incorporating bowtie nanoantenna arrays with stimuli-responsive polymer”, Scientific Reports, 5, 18567 (2015). 48. H. Jiang, L. J. Halverson, and L. Dong, “A miniature microbial fuel cell with conducting nanofibers-based 3D porous biofilm,” Journal of Micromechanics and Microengineering, 25, 125017 (2015). 47. P. Liu, S. Yang, A. Jain, Q. Wang, J. Song, C. M. Soukoulis, T. Koschny, and L. Dong, “Tunable meta-atom using liquid metal embedded in stretchable polymer,” Journal of Applied Physics, 118, 014504 (2015). 46. H. Peng, X. Liu, R. Wang, F. Jia, L. Dong, and Q. Wang, "Emerging nanostructured materials for musculoskeletal tissue engineering," Journal of Materials Chemistry, 2, 6435-6461 (2014). 45. L. Liu, Z. Xu, L. Dong, and M. Lu, "An angular spectrum detection instrument for label-free photonic crystal sensors," Optics Letters, 39, 2751-2754 (2014). 44. H.W. Jiang, Z. Xu, M.R. Aluru, and L. Dong, "Plant-chip for high-throughput phenotyping of Arabidopsis," Lab on a Chip, 14, 1281-1293 (2014) (Featured on Back Cover). 43. D. Mao, X. Qiao, and L. Dong, "Design of nano-opto-mechanical reconfigurable photonic integrated circuit," IEEE/OSA Journal of Lightwave Technology, 31, 1660-1669 (2013). 42. 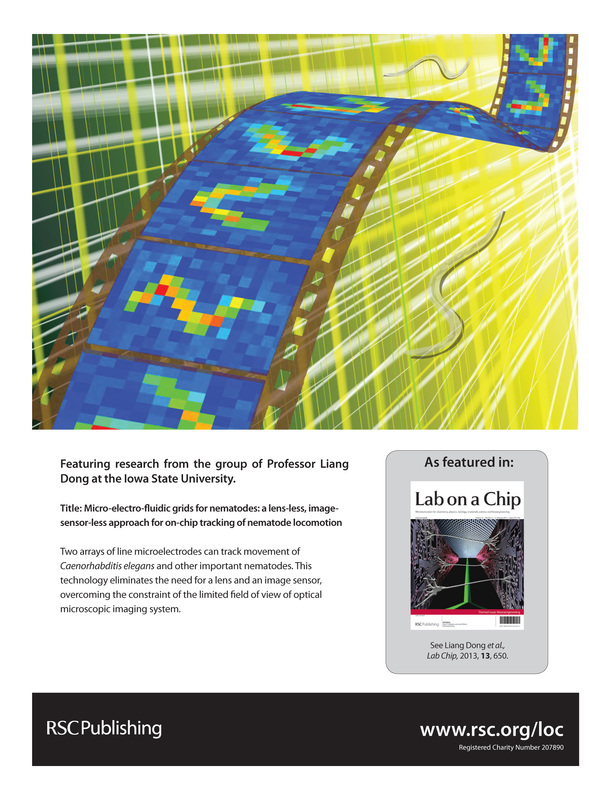 P. Liu, R. J. Martin, and L. Dong, "Micro-electro-fluidic grids for nematodes: A lens-less, image-sensor-less approach for on-chip tracking of nematode locomotion," Lab on a Chip, 13, 650-661 (2013) (Featured on Back Cover). 41. H. Yang, X. Qiao, W. Hong, and L. Dong, “Core-shell microcapsules with embedded microactuators for regulated release”, IEEE Journal of Microelectromechanical Systems, 22, 509-518 (2013). 37. H. Yang, W. Hong, and L. Dong, “A controlled biochemical release device with embedded nanofluidic channels”, Applied Physics Letters, 100, 153510 (2012). 36. H. Yang, C.R. Lightner, and L. Dong, “Light-emitting coaxial nanofibers”, ACS Nano, 6, 622–628 (2012). 35. L. Dong, “Toward optoelectronic textiles” (invited) SPIE Newsroom, DOI: 10.1117/2.1201204.004201, 1-3 (2012). 19. R.F. Yue, L. Dong, and L.T. Liu, PECVD boron-doped a-Si thin film for room-temperature infrared detection and thermal sensing, J. Vac. Sci. Technol. 26, 277-281 (2006). 18. R.F. Yue, L. Dong, and L.T. Liu, Integrated a-Si:B microbolometer arrays based on improved porous silicon micromachining techniques, Chin. Phys. Lett. 23, 1331-1334 (2006). 13. L. Dong, RF. Yue, and L.T. Liu, and W.J. Zhang, "Freestanding a-Si thin film transistor for room-temperature infrared detection," Chin. Phys. Lett. 21, 262-265 (2004). 8. L. Dong, R.F. Yue, and L.T. Liu, "Optical and thermal design for microbolometer," J. Infrared and Millimeter Waves 22, 109-113 (2003). 7. L. Dong, R.F. Yue, L.T. Liu, Y. Xu, and Z.J. Li, "Influence of thermal environment on electrical properties of micromachined polysilicon thin film resistor," Research & Progress of Solid State Electronics, 24, 508-513 (2003). 6. J. Zhou, X.H. Wang, P. J. Yao, L. Dong, and L.T. Liu, "Analysis and design of an accelerometer fabricated with porous silicon as sacrificial layer," Chin. J. Semicon. 24, 687-692 (2003). 3. L. Dong, R.F. Yue, and L.T. Liu, "Uncooled infrared detector based on temperature dependence of drain current of MOSFET," Infrared Laser Engineering 31, 534-539 (2002). 1. J. Zhou, X.H. Wang, L. Dong, and L.T. Liu, Study on selective formation of porous silicon as a sacrificial layer in microstructure, Microfabrication Technology, 2, 48-52 (2002). 69. L. Dong, Miniature sensors for soil and plant analytics, The International Conference on Nano/Micro Engineered and Molecular Systems, April 22-26, 2018, Singapore (invited). 68. T. Shawana, L. Dong, and R. Kumar, Heater integrated nanopatterned optical fiber-tip to realize a reusable gas sensor, SPIE Optical Engineering + Applications, August 19-23, 2018, San Diego, CA. 67. H. Jiang, C. Yang, K. Yang, and L. Dong, A sub-ppb-level integrated electrochemical heavy metal ion microsensor, Hilton Head Workshop 2016: A Solid-State Sensors, Actuators and Microsystems Workshop, June 3-7, 2018, Hilton Head Island, SC, USA. ​66. Y. Wang, W. Yuan, M. Kimber, M. Lu, and L. Dong, Rapid discrimination of host and parasite exosomes using label-free optical biosensor, Hilton Head Workshop 2016: A Solid-State Sensors, Actuators and Microsystems Workshop, June 3-7, 2018, Hilton Head Island, SC, USA. 65. S. Tabassum, L. Dong, and R. Kumar, Dynamic variations in optical properties of graphene oxide in response to gas exposure as determined from thin-film interference, SPIE Commercial and Scientific Sensing and Imaging, April 15 - 19, 2018, Orlando, FL. 64. Y. Wang, M. A. Ali, L. Dong, and M. Lu, An optofluidic metasurface for lateral flow-through detection of cancer biomarker, SPIE BiOS Symposium, January 27 - February 1, 2018, San Francisco, CA . 63. L. Dong, Microfluidic plant, soil and nematode assay chips for high-throughput plant phenotyping and sustainable agricultural management, IEEE Sensors Conference 2017, October 29 - November 1, 2017, Glasgow, Scotland, UK (invited). 62. L. Dong, High-throughput phenotyping of morphological traits and nutrient uptake of plants using microfluidics devices. The 21st International Conference on Miniaturized Systems for Chemistry and Life Sciences (MicroTAS 2017), October 22-26, 2017, Savannah, GA (invited). ​61. Y. Wang, M. A. Ali, L. Dong, and M. Lu, A lateral flow-through label-free biosensor based on silicon photonics, The 21st International Conference on Miniaturized Systems for Chemistry and Life Sciences (MicroTAS 2017), October 22-26, 2017, Savannah, GA (accepted). 60. Y. Tian, Y. Chen, H. Li, R. Waldman, H. Hu, and L. Dong, Patterned microfluidic open surface (PMOS) for collection and manipulation of particulate matters in air, The 21st International Conference on Miniaturized Systems for Chemistry and Life Sciences (MicroTAS 2017), October 22-26, 2017, Savannah, GA (accepted). ​59. Q. Wang, D. Mao, J. Zhu, and L. Dong, NEMS-based asymmetric split ring resonators for thermomechanically tunable infrared metamaterials, The 17th IEEE International Conference on Nanotechnology (IEEE NANO 2017), July 25-28, 2017, Pittsburgh, PA (ORAL). 58. S. Oren, H. Ceylan, and L. Dong, Tubular graphene sensors formed within planar and helical microfluidic channels, The 17th IEEE International Conference on Nanotechnology (IEEE NANO 2017), July 25-28, 2017, Pittsburgh, PA (ORAL). 57. Q. Wang, W. Han, Y. Wang, M. Lu, and L. Dong, Tape-based flexible metallic and dielectric nanophotonic devices and metamaterials, The 17th IEEE International Conference on Nanotechnology (IEEE NANO 2017), July 25-28, 2017, Pittsburgh, PA (ORAL). 56. H. Jiang, M. A. Ali, Y. Jiao, B. Yang, and L. Dong, In-situ, real-time monitoring of nutrient uptake on plant chip integrated with nutrient sensor, The 19th International Conference on Solid-State Sensors, Actuators and Microsystems (Transducers 2017), June 18-22, 2017, Kaohsiung, Taiwan (ORAL). 55. Q. Wang, D. Mao, P. Liu, and L. Dong, Nanoelectromechanical systems-enabled tunable metamaterials, The 19th International Conference on Solid-State Sensors, Actuators and Microsystems (Transducers 2017), June 18-22, 2017, Kaohsiung, Taiwan (ORAL). 54. M. A. Ali, Y. Jiao, S. Tabassum, Y. Wang, H. Jiang, and L. Dong, Electrochemical detection of nitrate ions in soil water using graphene foam modified by TIO2 nanofibers and enzyme molecules, The 19th International Conference on Solid-State Sensors, Actuators and Microsystems (Transducers 2017), June 18-22, 2017, Kaohsiung, Taiwan (ORAL). 52. S. Oren, Z. Wang, X. Wang, S. Tabassum, Y. Jiao, B. J. Montgomery, N. Neihart, C. M. McNinch, P. S. Schnable, and L. Dong, Tracking of water movement dynamics inside plants using leaf surface humidity sensors, The 12th IEEE International Conference on Nano/Micro Engineered and Molecular Systems (IEEE-NEMS 2017), April 9-12, 2017, Los Angeles, CA, USA (ORAL). 51. X. Wang, H. Jiang, Y. Wang, and L. Dong, Generation of temperature gradient on microfluidic plant chip for high-throughput plant phenotyping, The 12th IEEE International Conference on Nano/Micro Engineered and Molecular Systems (IEEE-NEMS 2017), April 9-12, 2017, Los Angeles, CA, USA (ORAL). 50. M.A. Ali, K. Mondal, Y. Wang, N.K. Mahal, M.J. Castellano, and L. Dong, The 30th IEEE International Conference on Micro Electro Mechanical Systems (IEEE-MEMS 2017), January 22-26, 2017, Las Vegas, NV, USA. ​49. M.A. Ali, S. Tabassum, Q. Wang, Y. Wang, R. Kumar, and L. Dong, Plasmonic-electrochemical dual modality microfluidic sensor for cancer biomarker detection, The 30th IEEE International Conference on Micro Electro Mechanical Systems (IEEE-MEMS 2017), January 22-26, 2017, Las Vegas, NV, USA. 48. S. Tabassum, Y. Wang, J. Qu, Q. Wang, S. Oren, R. J. Weber, M. Lu, R. Kumar, and L. Dong, Patterning of nanophotonic structures at optical fiber tip for refractive index sensing, IEEE Sensors Conference, Oct 30-Nov 2, 2016, Orlando, FL, USA (ORAL). 47. Z. Xu, X. Wang, R. J. Weber, R. Kumar, and L. Dong, Microfluidic electrophoretic ion nutrient sensor, IEEE Sensors Conference, Oct 30-Nov 2, 2016, Orlando, FL, USA. 46. S. Oren, S. Tabassum, Y. Jiao, H. Ceylan, M.A. Ali, and L. Dong, Wearable graphene sensors on adhesive tapes, Hilton Head Workshop 2016: A Solid-State Sensors, Actuators and Microsystems Workshop, June 5-9, 2016, Hilton Head Island, SC, USA (ORAL). 45. H. Jiang, M.A. Ali, Z. Xu, L.J. Halverson, and L. Dong, Microfluidic flow-through microbial fuel cells, Hilton Head Workshop 2016: A Solid-State Sensors, Actuators and Microsystems Workshop, June 5-9, 2016, Hilton Head Island, SC, USA. 44. Z. Xu, Y. Wang, Y. Chen, M.H. Spalding, and L. Dong, Microfluidic microalgal bioreactor for high-throughput screening of CO2 concentration conditions on microalgae growth, Hilton Head Workshop 2016: A Solid-State Sensors, Actuators and Microsystems Workshop, June 5-9, 2016, Hilton Head Island, SC, USA (ORAL). 43. Y. Jiao, C. Young, S. Yang, C. Halil, and L. Dong, Flexible graphene strain sensors with liquid metal interconnectors for embedded structural health monitoring and skin tactile sensing, Hilton Head Workshop 2016: A Solid-State Sensors, Actuators and Microsystems Workshop, June 5-9, 2016, Hilton Head Island, SC, USA. ​42. M.A. Ali, S. Oren, Y. Jiao, Y. Wang, Z. Xu, and L. Dong, Microfluidic label-free immunochip for early diagnostics of breast cancer using functionalized porous graphene, Hilton Head Workshop 2016: A Solid-State Sensors, Actuators and Microsystems Workshop, June 5-9, 2016, Hilton Head Island, SC, USA. 41. X. Wang, X. Qiao, and L. Dong, Low-cost, high-throughput microfluidic droplet incubators capable of generating stable thermal gradient, Hilton Head Workshop 2016: A Solid-State Sensors, Actuators and Microsystems Workshop, June 5-9, 2016, Hilton Head Island, SC, USA. ​40. P. Liu, S. Yang, Q. Wang, M. Yang, J. Song, and L. Dong, Flexible wide-band two-arm spiral antenna for directivity optimization, Hilton Head Workshop 2016: A Solid-State Sensors, Actuators and Microsystems Workshop, June 5-9, 2016, Hilton Head Island, SC, USA. 39. Y. Wang, L. Dong, and L. Meng, Optical bound states of 2D high-contrast grating for refractometric sensing. 2016 Conference on Lasers and Electro-Optics (CLEO), June 5-10, 2016, San Jose, CA, USA. 38. S. Yang, P. Liu, L. Dong, and J. Song, Microwave meta-skin for tunable frequency selective surface and flexible invisibility cloak. The 2016 IEEE International Symposium on Antennas and Propagation and North American Radio Science Meeting, June 26 - July 1, 2016, Fajardo, Puerto Rico (ORAL). 37. S. Tabassum, Q. Wang, W. Wang, S. Oren, M. A. Ali, R. Kumar, and L. Dong, Plasmonic crystal gas sensor incorporating graphene oxide for detection of volatile organic compounds. The 29th IEEE International Conference on Micro Electro Mechanical Systems (MEMS 2016), January 24 - 28, 2016, Shanghai, China. 36. M. A. Ali, H. Jiang, and L. Dong, Nitrate biosensors using graphene oxide-decorated nanofibers, 18th International Conference on Solid-State Sensors, Actuators and Microsystems (Transducers 2015), June 21-25, 2015, Anchorage, Alaska, USA (Open poster). 35. Y. Wang, L. Liu, Q. Wang, W. Han, L. Dong, and M. Lu, Strain-tunable two-dimensional plasmonic Crystal, The 2015 IEEE Photonics Conference, 28th Annual Conference of the IEEE Photonics Society (IPC), October 4-8, 2015 Reston, Virginia, USA. 34. ​Y. Wang, L. Liu, Q. Wang, and L. Dong, Mechanically tunable plasmonic crystal, 18th International Conference on Solid-State Sensors, Actuators and Microsystems (Transducers 2015), June 21-25, 2015, Anchorage, Alaska, USA (Open poster). 33. P. Liu, S. Yang, Q. Wang, H.W. Jiang, J. Song, and L. Dong, Bioanisotropic stretch-tuning left-handed metamaterials using microfluidic liquid metal and highly stretchable polymer, The 18th International Conference on Miniaturized Systems for Chemistry and Life Sciences (MicroTAS 2014), Oct. 26-30, 2014, San Antonio, TX. 32. H.W. Jiang, L. J. Halverson, and L. Dong, Microscale Microbial fuel cell using 3D bioanode with electrospun conductive nanofibers and micropillars, The 18th International Conference on Miniaturized Systems for Chemistry and Life Sciences (MicroTAS 2014), Oct. 26-30, 2014, San Antonio, TX. 31. B. Britz, E. Ng, H.W. Jiang, Z. Xu, R. Kumar, and L. Dong, Nitrate-selective electromechanical sensors with electrospun nanofibers modified microelectrodoes. 2014 IEEE International Conference on Systems, Man, and Cybernetics, Oct. 5 - 8, 2014, San Diego, CA, USA. 30. H.W. Jiang, Z. Xu, M.R. Aluru, and L. Dong, A microfluidic whole-plant phenotyping device,The 17th International Conference on Solid-State Sensors, Actuators and Microsystems (Transducers 2013), June 16-20, 2013, Barcelona, Spain, pp. 1539-1542. 29. D. Mao, P. Liu, Q. Wang, and L. Dong, Nano-electro-mechanical systems tunable photonic crystal-cantilever cavity resonator, The 4th Annual Nanofrontiers Symposium, Columbia, Missouri, June 6-7, 2013. 28. H.W. Jiang, X. Qiao, Y. Jiao. L.J. Halverson, and L. Dong, Microfluidic microbial fuel cells, The 4th Annual Nanofrontiers Symposium, Columbia, Missouri, June 6-7, 2013. 27. Q. Wang, Z. Xu, P. Liu, H.W. Jiang, Y.J. Liu, W. Hong, M.H. Spalding, and L. Dong, Microfluidic cytometer with 3D hydrodynamic focusing, The 4th Annual Nanofrontiers Symposium, Columbia, Missouri, June 6-7, 2013. 26. P. Liu, D. Mao, R.J. Martin, and L. Dong, An integrated fiber-optic microfluidic device for detection of multicellular organism mechanics, The Solid-State Sensor, Actuator and Microsystems Workshop (Hilton Head 2012), Hilton Head Island, SC, June 3-7, 2012. 25. D. Mao, P. Liu, and L. Dong, All-optical programmable photonic integrated circuit: an optical analogy to electronic FPGA, The 16th International Conference on Solid-State Sensors, Actuators and Microsystems (Transducers 2011), June 5-9, 2011, Beijing, China pp. 2674-2677. 24. H. Yang, MK Bhattacharyya, and L. Dong, Plant pathogen spores in microfluidic droplets: A high throughput approach to antifungal drug screening, The 16th International Conference on Solid-State Sensors, Actuators and Microsystems (Transducers 2011), June 5-9, 2011, Beijing, China pp. 2235-2238. 23. H. Yang and L. Dong, Smart drug delivery using electrospun hollow nanofibers. The 23rd IEEE International Conference on Micro Electro Mechanical Systems (MEMS 2010), Jan. 24 - 28, 2010, Hong Kong. 22. H. Yang and L. Dong, Electroluminescent organic light emitting micro/nanofibers fabricated using three-fluid coaxial electrospinning, IEEE Nanotechnology Materials and Devices Conference (NMDC 2009), Traverse City, Michigan, USA. June 2 - 5, 2009, pp. 118 – 120. 21. D. Mao and L. Dong, Disposable bio-chemical sensors using micro-imprinted stimuli-responsive hydrogel diffraction grating. The 15th International Conference on Solid-State Sensors, Actuators and Microsystems (Transducers 2009), Denver, Colorado, USA. June 21 - 25, 2009, pp. 152-155. 17. L. Dong, A. K. Agarwal, D. J. Beebe and H. Jiang. Environment-adaptive variable-focus liquid microlenses, The Solid-State Sensor, Actuator and Microsystems Workshop (HH’06), Hilton Head Island, SC, Jun. 2006, pp. 414-415. 16. R.F. Yue, L. Dong and L. T. Liu. An uncooled microbolometer based on a-Si thermistor with suspended microbridge structure, The Asia-Pacific Conference of Transducers and Micro-Nano Technology, Singapore, Jun. 2006, A0224, pp. 1-4. 15. L. Dong, A. K. Agarwal, S. S. Sridharamurthy, D. J. Beebe and H. Jiang. A tunable liquid microlens driven by temperature-sensitive hydrogel, The 9th Miniaturized Systems for Chemistry and Life Sciences (MicroTAS2005), Boston, MA, Oct. 2005. 11. X.F. Zeng, R.F. Yue, J.G. Wu, H. Hu, L. Dong, and L.T. Liu, Deposition of new hydrophobic films of fluorocarbon polymer, The 2nd National Conference on Information Acquisition and Processing, Dalian, China, Aug. 2004. 10. X.F. Zeng, L. Dong, J.G. Wu, R.F. Yue, and L.T. Liu, Study of the electrowetting-on-dielectric (EWOD), The 2nd National Conference on Information Acquisition and Processing, Dalian, China, Aug.2004. 9. S. Fu, L. Dong, R.F. Yue, and L.T. Liu, PDMS-based microfluidic device with capability of metering and mixing, The 2nd National Conference on Information Acquisition and Processing, Dalian, China, Aug. 2004. 8. J.G. Wu, R.F. Yue, X.F. Zeng, L. Dong, and Liu Litian, Investigation of reflective display cell based on electrowetting-on-dielectric, The 2nd National Conference on Information Acquisition and Processing, Dalian, China, Aug. 2004. 4. L. Dong, R.F. Yue, W.T. Huang, and L.T. Liu, Preparation of poly-Si0.7Ge0.3 film, The 4th Youth Academic Conference of China Instrument and Control Society, Beijing, China, Sep.2002. 3. L. Dong, R.F. Yue, and L.T. Liu, Study on using porous silicon as sacrificial layer in high resistivity silicon, The 4th Youth Academic Conference of China Instrument and Control Society, Beijing, China, Sep. 2002. 2. J. Zhou, X. Wang, K.W. Xie, L. Dong, and L.T. Liu, Study on the micromachining of porous silicon formed selectively in low-doped substrate, The Pacific Rim Workshop on Transducers and Micro/Nano Technologies, Xiamen, China, Jul. 2002, 22-24. 1. L. Dong, L.T. Liu, and R.F. Yue, A novel micromachined uncooled infrared detector employing a-Si:H TFT as thermosensitive element, Proceeding of SPIE 4602, 2001, pp. 344-349. 1. Time-lapse movie showing germination of a F. virguliforme conidium. 2. Time-lapse movie showing sporulation in F. virguliforme. 1. MATLAB Codes for analyzing images of spore growth within microfluidic channels by comparing changes in pixels from image to image to determine how much growth occurs in marked regions.